One of the biggest trends for the season (and one that we predicted) is MENSWEAR in all of its traditional forms. From Double Breasted suiting to Pin stripes and Loafers, this season is all about taking styling cues from ONE OF THE GUYS. Suiting has been a trend for the past several seasons; however, this season DOUBLE-BREASTED SUITING takes center stage. Tommy Hilfiger led the menswear trend with amazing double-breasted suits paired with fedoras and capes to tell a late 70′s influenced story, while Dolce and Gabbana hit us with a dose of 1950′s Teddy Boy references in their walking short double breasted suits. Paul Smith, Ferragamo, The Row and many others showcased this trend in classic interpretations of age old menswear. Other designers such as Stella McCartney re-interpreted the classic basic in new shapes and colors for the modern girl. The suiting is worn classic with loafers, menswear ties, crisp shirts and hats. If you don’t want to invest in a complete suit, I would recommend buying a great double-breasted blazer. Besides, everyone should have one of these in your closet as a staple…I have three! PIN-STRIPES were featured at Salvatore Ferragamo in a nod to the late 80′s classic movie “Working Girl“. Pin Stripes were seen in traditional suiting as well as in tailored dresses and pants. Vivienne Westwood showed modern versions as did Three as Four who interpreted the classic fabric in a draped jumpsuit. Ashish sent out sequin pinstripes and Dolce and Gabbana paired pin striped suits with Creepers and Boaters for their Teddy Boy look. Look for pin stripe fabrications to be used in more of a modern style referencing Haider Ackerman’s draped Kimono looks. 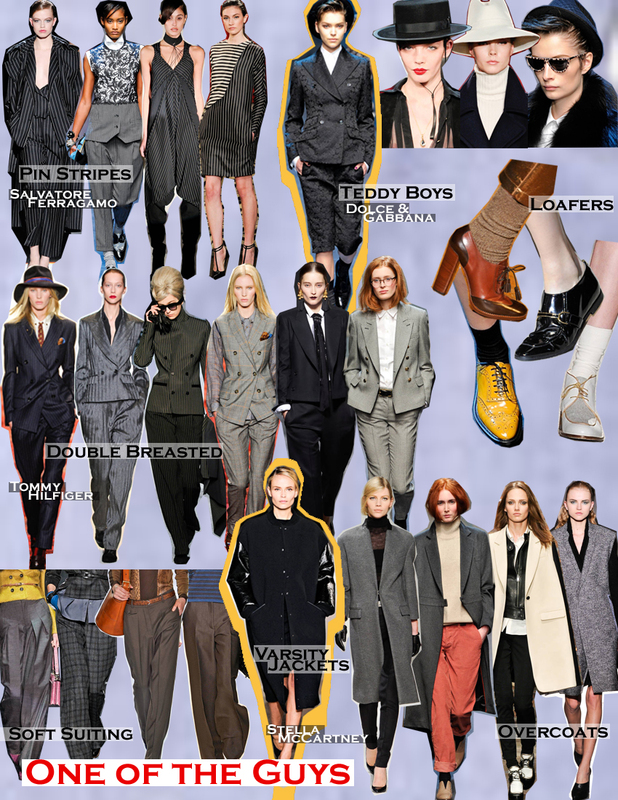 SOFT SUITING came on the scene this Spring, and made a much bigger presence for Fall. Seen in various tweeds and wools, trousers are full and have some drape as a contrast to the tailored suiting seen from Tommy Hilfiger and Ferragamo. Chloe, Gaultier and Gucci paired their soft trousers with cropped fur jackets, cropped cardigans and blazers. This trouser is a Fall interpretation of the long and languid trousers seen this Spring from Dries Van Noten in crisp cotton. LOAFERS were a huge hit on the runway and are seen in various forms from Creepers, to Spectator heels, ankle boots and classic styles. There is no doubt that this type of shoe is a MUST HAVE for Fall. There will be many variations and the Junior and Lower priced retailers will be re-interpreting this style in a multitude of ways. Look for lace-ups, pull-on penny loafer styles, tassels, stacked heels and foam bottoms ala Prada’s S/S 2011 popular creeper. VARSITY JACKETS were seen in amazing re-interpretations from Stella McCarney’s elongated version to Rag and Bone’s classic style. Givenchy did a darker interpretation and Sonia Rykiel went oversized and slouchy. Look for this rounded collar approach to jackets as the easiest interpretation from Designers. Also expect traditional Varsity styles to be rummaged from Vintage stores to become a trend on the streets with the Hipster crowd as the Teddy Boy look starts to make its mark. OVERCOATS are tailored and long taking their cues from classic Men’s styles. Classically worn over suits, many were seen draped over the shoulder on the runway to drive home the look. Seen in classic menswear fabrications as well as alternative brights, this Classic coat will be seen everywhere come Fall.